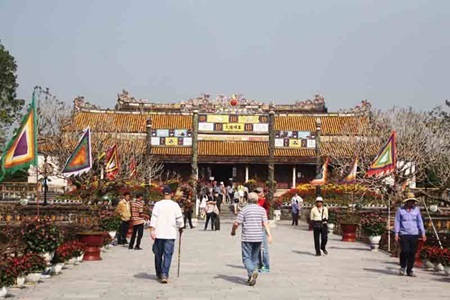 Hue will offer free entry to its monument for three days over the Tet holiday, giving locals and tourists access to the former royal city. Visitors at the Thai Hoa Palace inside the former Royal Citadel in Hue. The weather is pretty nice in days ahead Tet. According to the Hue Monuments Conservation Centre, entry to all monuments would be free of charge from February 19-21. Visitors will have the chance to watch the Changing of Guards at Ngo Mon Gate, performances of nha nhac (Hue royal court music) at Thai Hoa Palace and The Mieu Temple, and royal games and calligraphy in the palace courtyard. Unicorn dancing and martial arts will replace the royal games on the second and third days. All performers and acting royal guards will dress in traditional costume. At Khai Tuong Lau Pavilion inside An Dinh Palace on the south bank of the Huong River, visitors will enjoy a collection of antiques used by the country's last king, Bao Dai (1926-1945). Photos of the king's wife, Queen Nam Phuong, who was famous for her beauty and benevolence, are also on display, alongside the pavilion's gorgeous murals.